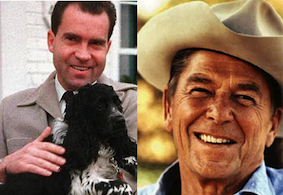 Ronald Reagan some say he was one of America best president, some say Nixon was the worst. The reason for Reagan large win was the failure of Carter's economic policies and America's weak image abroad, winning him 51 percent of the popular vote. Scoring Republicans a major win yet most Americans voted hoping for economic relief. With Nixon Republicans sought to win new voters among traditionally Democratic blue-collar workers and southern Whites. Reagan supported supply-side economics, seeking to diminish the tax burden on the private sector and enhance investment-oriented growth. Reduction of government spending would hopefully ease inflation. Major congressional victories gave Reagan a 25 percent cut in personal income taxes over three years and significant reduction of domestic appropriations for social services. The Reagan administration’s sweeping economic changes gave rise to conflicting economic expectations. Reagan put his faith in supply-side economics—he believed tax relief for investors would spark quick business growth. The failure of supply-side economics fed a huge and growing federal deficit.A decline in exports led to an alarming second deficit in the balance of overseas trade. Reaganomics maintained a high American standard of living through massive borrowing that threatened the economic security of future generations. Under Reagan, the rich got richer, the middle class scrambled to hold its own, and the poor stayed poor. Nixon inherited severe economic problems that did not seem to respond to traditional remedies. He curbed inflation with temporary wage and price freezes and improved the balance of trade with a devaluation of the dollar and a 10 percent tax on imports. The more diversified multinational corporations and conglomerates fared better. Within the United States, industry shifted increasingly to the Sunbelt, with high-technology industries as computer and electronics firms proving most profitable. Determined to alter America's shattered image abroad, Reagan made new military expenditure and went to develop new weapons systems, and to an expanded our navy. Nixon pursued a foreign policy of détente—a relaxation of tension—with the Soviet Union and with China. Following his plan to use American trade to thaw relations, the president engineered sales of grain and computer technology to the Soviet Union. Congress cut military aid to South Vietnam and refused to grant additional aid the next year as Communists seized control. Reagan denounces Soviet sponsored terrorism and human rights violations and pushed for the deployment of additional. The nuclear arms race reached an unprecedented level. The United States made no significant effort to halt the Israeli invasion of Lebanon but did agree to send troops under multinational direction. Despite Reagan’s aspirations, the Arab-Israeli conflict continued to worsen. With Reagan hoping to rebound from the Iran-Contra affair and Gorbachev anxious to repair the Soviet economy, the two world leaders held a series of meetings during Reagan's second term. The resulting treaty, signed in late 1987, banned intermediate nuclear missiles. 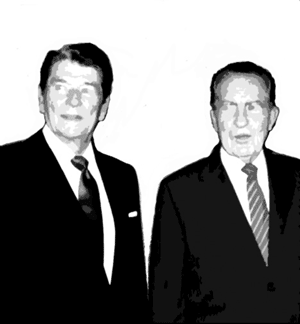 U.S.-Soviet cooperation eased tensions in global hot spots, further enhancing Reagan's reputation. Reagans stands on many social issue helped to keep him in high popularity. While the Nixon administration's inordinate fear of political enemies led to numerous illegal activities by Republican officials and campaign supporters, including plans to break into the Democratic national headquarters in the Watergate building. Nixon probably did not have any knowledge of the break-in, but he committed a criminal act by authorizing a far-reaching cover-up. Americans seeing a president almost impeached made us see him as a terrible pesident. So if you look at the many similarity between the two, it makes you wonder why one is so hated and the other so loved.